Yesterday morning, 7 of us – including a remarkably fresh looking PhilL – gathered at the Canoe Centre in the Bedford Road. Also there was the leader for the day’s Sky Ride, which was heading off along the riverside at 10:00. We wished him luck as we were starting out in the same direction. Shortly after 09:30, Milton led us out through the town along the river, and then the canal, before emerging onto Banbury Lane to head for the hills of western Northamptonshire. Litchborough, Farthingstone (at which point PhilL left us, being under strict instructions to build mileage slowly. He did tackle the steepest hill on the ride before peeling off though. I’m sure that was a coincidence), Everdon, Badby and Catesby came and went fairly quickly. So quickly, in fact, we arrived at lunch before the pub was open! After settling down to sandwiches, baguettes and chips for an hour, we took to the road again with Milton promising us that (almost) all the hills were done with, and it proved to be a remarkably level trip back through Charwelton, Preston Capes and Maidford before we dropped over the A5 and then had to climb again to Gayton, working our way round the south of the town and down the last hill through Great Houghton (where of course we’d followed the route of the Women’s Tour 12 weeks earlier. Anyone know what Vos and Armitstead were up to yesterday?). Many thanks to Milton for laying on such an interesting route, ordering the tailwind for the return leg and showing us some different stretches of tarmac in an area we all thought we knew pretty well already. On a mild damp day, 7 of us met up for a short 30 mile ride to Kelmarsh Buddhist Centre for coffee and cake via Holcott and Harrington and returned to Moulton by means of Arthingworth and Scaldwell and not the Brampton Valley Way as first planned. Pouring rain during our tea break meant the BVW surface would be less than good for the bikes, and our esteemed Chairman was, after all, out on his fine Bianchi! A lovely day, even in the wet, and with three first timers, including the visiting Ken from Morecambe, a good club day. Numbers taking part = 18. We raised £90 for Headway Charity though a cheque for £100 was forwarded to them. 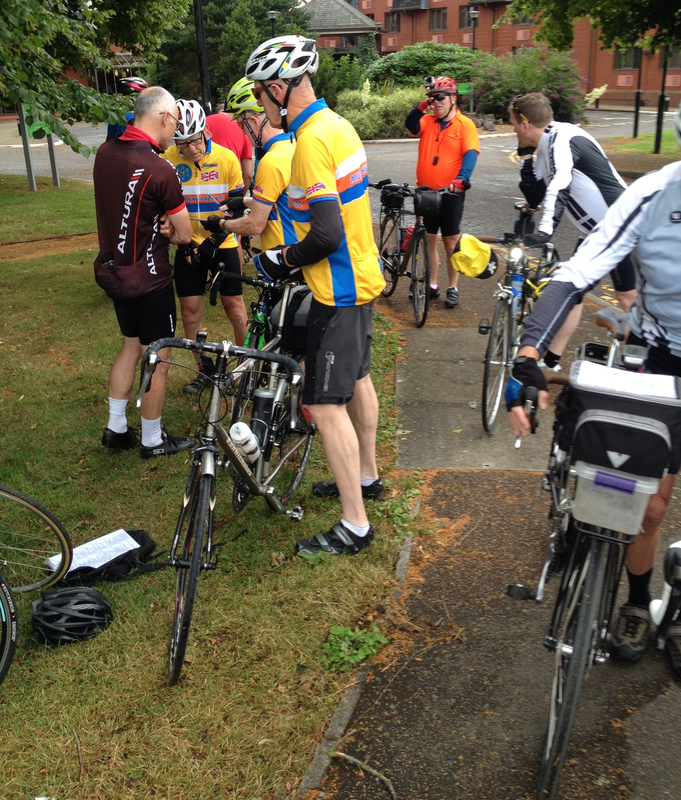 The other riders were a mix of Northampton, Milton Keynes and one CTC member from Wellingborough. Most of you have supported this ride over the last 9 years and the fact that you still do is very much appreciated by the benefactors Headway. As for the ride itself, it is always a ride that produces great spirit… The ride through the east side of the county as it heads for Bedfordshire through the villages of Sharnbrook and Thurleigh to name but two, just seem to fly by effortlessly, with a constant chatter of voice and the sounds of gears and wheels. As is normal on this ride the bunch splits with some stopping and enjoying the fayre at Thurleigh (the healthy food option) while others prefer to get the bulk of the ride behind them and they press on to St. Neots. As usual the groups meet at St. Neots at The Market Café for a short exchange of pleasantries of the ride encountered thus far. The split at St. Neots continued, only the split of two groups became three. Then as the ride heads for home the chatter recedes as it progresses on the road towards Kimbolton. This is always a sign that a headwind is encountered and so it proved to be… Poddington Garden Centre is always a welcome break from that constant element, and an enjoyable stop for afternoon coffee. The final miles back to Northampton seem to fly by. As far as I am aware, no p*nct*res were experienced though we did have one mechanical problem to deal with, soon put to rights by John and George …. Many thanks on behalf of Headway! 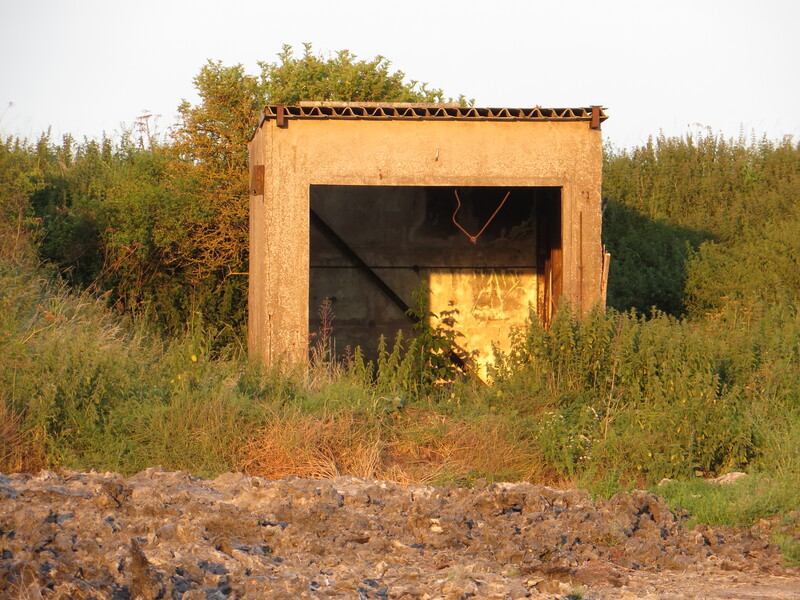 Last night’s ride was from our Brampton Valley Way meeting point out to the old airfield at Harrington. 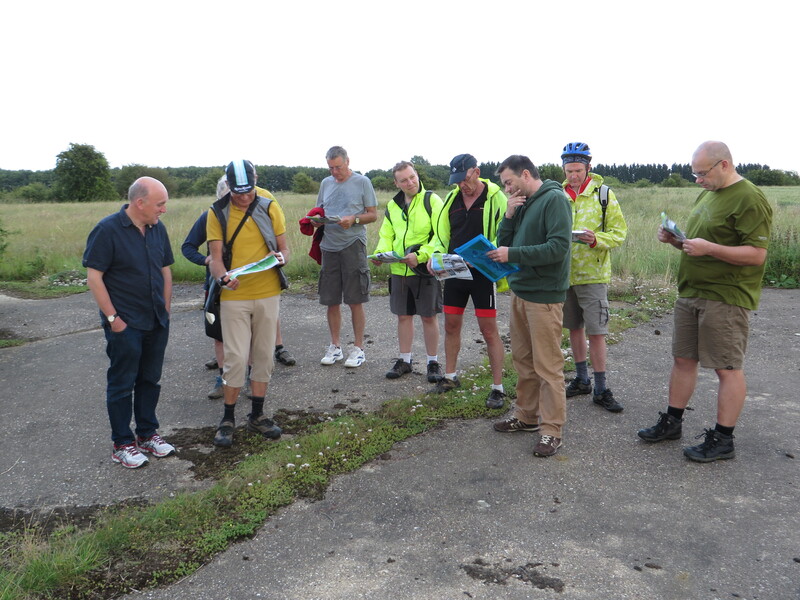 There were seven of us on the ride and others also made their way to Harrington so that ten of us met with Alex’s friend Steve for a guided walk over the remains of the airfield with particular reference to the part it played in the Cold War. Most people associate Harrington with American bombing raids over Germany from 1943 (and also perhaps with the dropping of SOE parachutists into occupied Europe) but few perhaps realise the part the airfield played fifteen years later in the Cold War. Between 1958 and 1963 (that’s from the launch of Sputnik to the Cuban Missile Crisis – the height of Soviet-American tension), Harrington was the home of one of the UK’s Thor Missile installations. It housed three intermediate range ballistic missiles (with a range capable of reaching Moscow) all tipped with nuclear warheads! Steve met us at the roadside closest to the main WWII runway. He gave us a short introduction, handed out a site plan of the airfield (which he had drawn himself) together with a collection of contemporary photographs, a map of all the other Thor sites, and cutaway drawings of the southernmost launch site and of a Thor missile. Then, having locked our bikes together out of view of the road, we went on a thorough walk (and a thoroughly entertaining walk) of the site. The southernmost of the three missile launch pads is the one that has crumbled away least and it was here that we spent most time. With a guide like Steve, and with his drawings and photos, it was not at all difficult to imagine the buildings and operations as they were over fifty years ago – albeit now there are just a few ruins of buildings and oddly unremarkable marks of the nuclear front line. 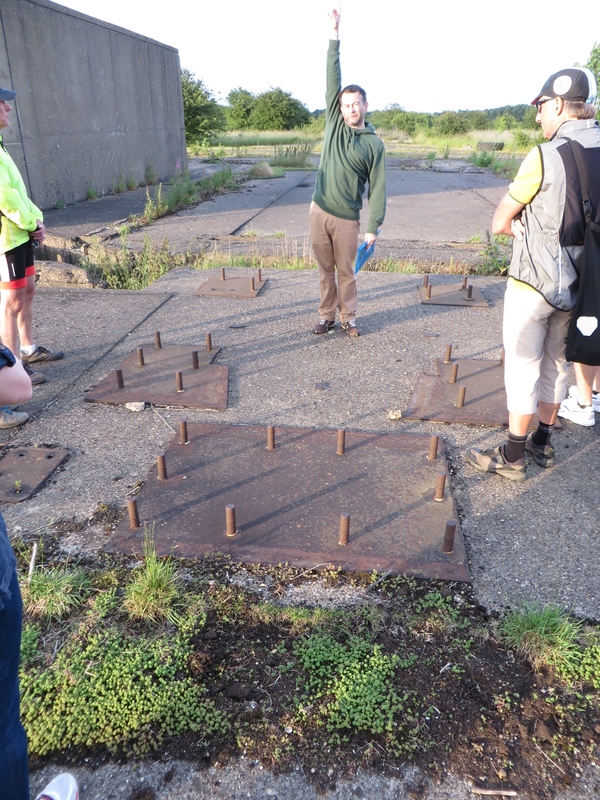 But, with our guide, we were able to make out very clearly everything from rusting wire (that had been part of the security fencing) to the erecting and launching pad for a missile (shades of Dr Strangelove!). There were the scarely visible paint marks which guided the personnel and the marks of the surveys which were used to aim the nuclear weapons. We walked past the middle and northernmost launch pads towards the part of the site that had been the US compound – and there, looking for all the world like a prefab garage for a minibus, was the warhead store – a building which for a few years had held three nuclear warheads! 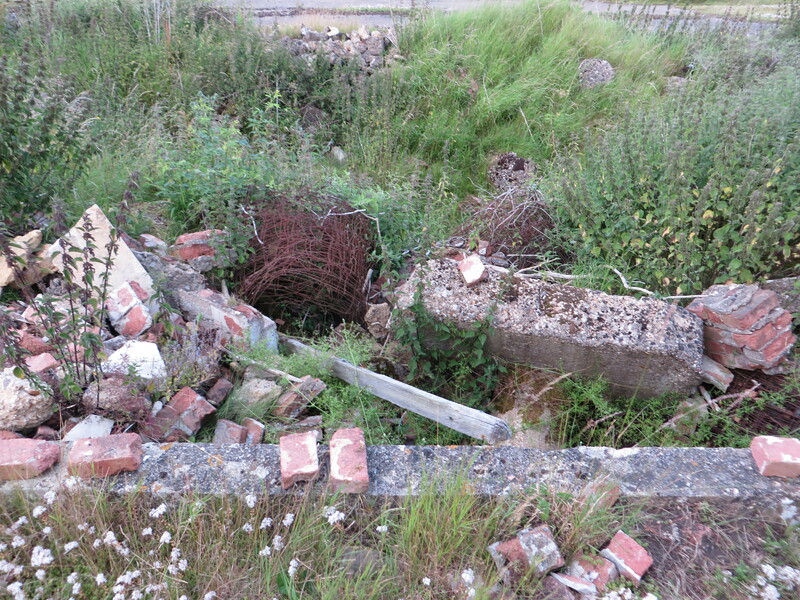 We met one or two birdwatchers – and a family from Rothwell who had always lived in the area and who remembered what their parents and grandparents had told them about the site. Then, after a good one-a-half hours at the site, it was time to pedal back to Northampton with the opportunity to carry on our discussions with Steve at The Brampton Halt. Truly a very memorable evening! Some of Steve’s work can be seen on the Facebook page of the Harrington Thor Preservation Society which is another treat!